The World Cup has been a heavily anticipated sporting event for many countries since the 1930s, representing one of those phenomenon that invite communities to abandon divisive tension in favor of coming together to cheer on the team representing their country. From Mexico to Iran and Morocco, and now even to the United States (whose team failed to qualify for this year’s tournament), families come together, huddled intimately around their television sets while someone else peers up at a large screen in a pub, surrounded only by the dull buzz of strangers also watching, each with a fermented drink of choice. 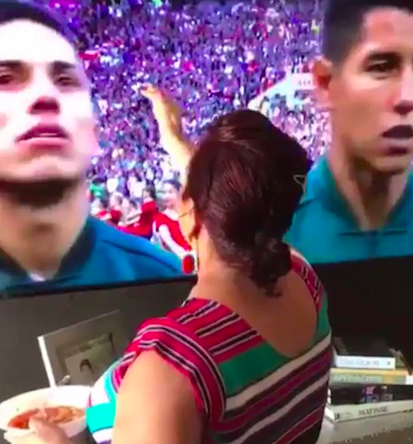 One sporting fan happened to catch my attention this season, a grandmother in a Mexican household who stood in front of her television before the Germany v. Mexico game kicked off and blessed every member of Mexico’s male soccer team as the camera focused in on each of their faces during the national anthem. She even made sure to bless the goalie twice, you know, just to be absolutely sure! The video, a screenshot of which is featured above, was widely circulated on social media the other day, with many proclaiming that there is nothing more precious or pure than a grandma’s blessing.